Luxury skiing is an art of the Alps – but the West has got it down, too. Popularized in the 1930s in Europe, the luxury ski vacation consisted of leisurely cruising down slopes, lounging for hours, long lunches with fine food and drinks, and cosying up in elegant mountain chalets for professionally prepared dinners. Chic boutique shops popped up in alpine towns. Amidst the refined glitz and glamour were activities like scenic hiking and tobogganing. And while time has passed, most would say that hardly a thing has changed: luxury and the ultimate ski vacation still go hand in hand, and in the Rocky Mountain West, this is no exception. Why luxury in the West? For one, it’s more accessible than the Alps. The spas are gorgeous. They may not always be called “chalets,” but the slopeside mansions offer families and large groups spacious elegance. Some resort towns are purpose built, while others still boast old western charm and lively locals willing to tell you all about how things “used to be” in the halcyon days gone by. The microbreweries are some of the finest in North America, and there’s plenty of opportunity to get a little wild (whiskey shot ski rounds on the bar, anyone?) Luxury skiing in the West is about more than just skiing – it’s an entire lavish experience you can share with the people you love. In this guide, you’ll find the best of what luxury skiing in the West has to offer. We’ll tell you where to go, what to do, and how to do it in style. You’ll get the insider scoop on best restaurants, nightlife, and shopping. We’ll also tell you where to find the best snow on a powder day, and where to warm up afterward with a good drink. Keep reading for our complete guide to luxury skiing in the West. When it comes to luxury skiing in the West, Beaver Creek sets the bar -- high. The ultra-posh neighbour of Vail, “The Beav” attracts ski vacationers who want everything from their lodging digs to their après drinks dripping in luxury. That said, the vibe of Beaver Creek is less pretentious than many assume. Yes, expect some members-only restaurants, moving walkways, white glove service, and a perfectly manicured pedestrian village; but also expect genuine friendliness and a family-friendly atmosphere chock full of kids activities. Oh yeah – there’s also the gourmet cookies every day at 3 p.m. sharp. Best For: Luxury loving families; over-the-top customer service. Stay…at The Osprey in Beaver Creek Village for ski-in/ski-out boutique luxury. Ski…the trees in Black Bear Glades off Grouse Mountain Express Lift on a powder day. Dine…at the Grouse Mountain Grill for dishes crafted from scratch and panoramic views of the mountain. Après...at the CBAR of the Beaver Creek Chophouse – top-notch whiskey selection and sleek western ambiance. Shop...for high-end home décor, ski gear, and kids clothing at Gorsuch. Nightlife…don’t miss good beats and a hot scene at Agave, Beaver Creek's best nightclub. Off The Slopes…enjoy a show at Vilar Performing Arts Center, which hosts ballets, symphonies, live music acts and more. Beaver Creek is perhaps one of the best designed mountains in the Rockies. With 1,815 skiable acres spread across 3 main areas, the mountain offers beginners, intermediates and advanced skiers ample slopes to work with. Beginners will appreciate access to the mountain’s summit and lapping the Drink Of Water Lift; intermediates can cruise mid-mountain or around the Centennial Express. Advanced skiers, get some thrills on Golden Eagle, the site of the infamous Birds of Prey World Cup Downhill. Snow quality and grooming are both top-notch. For close proximity to shopping and restaurants, book your stay in Beaver Creek Village; the quieter Bachelor Gulch is less of a scene, while Arrowhead is mostly private homes and condominiums. Lounge in luxury to the nines at the Ritz-Carlton Bachelor Gulch; slopeside access, gourmet dining, and a 21,000 square foot spa boost the Beaver Creek experience. The chalet-inspired Osprey is a favourite hotel at the base of the Strawberry Park Express Lift; expect amenities like in-room fireside flat screen TVs and valets who bring your gear to your room to get you ready for the day. If you stay one week or more with family and friends, consider renting a mountain chalet; these exquisite homes offer everything from home spas to expansive game rooms for the kids. Beaver Creek boasts fabulous restaurants; note that some spots are members-only, and others (like those listed here) book up months in advance for peak periods. The Grouse Mountain Grill prides itself on crafting their dishes from scratch, as well as sourcing ingredients from local business owners when possible; expect creative twists on western classics, like roasted sausage stuffed rabbit loin with pea tortellini and glazed carrot. Splendido at the Chateau boasts mountain views in an elegant dining room; new chef/owner Brian Ackerman recently reworked the menu to embody Beaver Creek flair, while in-house sommelier service helps you pair the perfect wine with your meal. The décor at Saddle Ridge makes this classic Colorado restaurant a favourite for kids; dine on Colorado classic cuisine in the midst of antiques and artifacts like – wait for it – Geronimo’s tomahawk and General Custer’s hat. Unlike neighbouring Vail, Beaver Creek is not known for its nightlife – the village quiets down after dinner; for a livelier scene, hop on the shuttle into downtown Avon. Check the live music calendar for Agave, Beaver Creek’s only (real) nightclub; the cocktails are crafty, and we love the balcony area where guests can watch performers and the dance floor from above. Cozy up to the bar at the Dusty Boot Saloon after an early dinner; it’s not traditionally a late-night spot, but you’ll have time for a couple of Moscow mules before close. Catch a performance at the Vilar Performing Arts Center; the venue attracts world renowned dance, theatre, and music acts year-round. Bring your black card for the lavish boutiques dotting Beaver Creek Village; you’ll find the most high-end outdoor and western wear in the Rockies, as well as finely crafted jewelry. Gorsuch boasts a large selection of boutique brands like Bogner, Fabiana Fellippi, and Iris Von Arnim; men, women and kids will find top of the line shoes, clothes, and outerwear. Shop shearling and leather outerwear at Avalon (men, you can find mountain chic clothing here too). By Nature Gallery’s stock is exquisite; you’ll find creations of petrified wood, fossils, meteorites and uniquely crafted jewellery from across the U.S.
Don’t be alarmed by the lederhosen clad, alpenhorn blowing Helmut Fricker – Beaver Creek’s very own mascot –whose been entertaining guests with local lore on village streets since the 1980s. If renting a private home, consider inviting a personal chef to cook one night; you’ll get the luxury nuts-to-nuts experience in the comfort of your “own” home. Hit the slopes: score the best deal for Beaver Creek. Whistler Blackcomb is a mecca for luxury ski vacation goers. At 8,171 ac, it is the largest ski resort in North America; previously separate mountains, Whistler and Blackcomb are now connected by gondola to offer skiers instant access to some of the best in bounds slopes in the Rockies. The purpose built base villages are pedestrian friendly and dotted with restaurants serving classic northwest fare, as well as international cuisine. While retreating to pristine spas and elegant hotel lounges are options, those who wish to party will feel right at home in the wide variety of bars and clubs. Best For: The large scale resort experience. Stay…at the Sundial Boutique Hotel, which overlooks Whistler Blackcomb gondolas. Ski…See the sights on Whistler’s longest slopes, Peak to Creek, which runs for 7 mi. Dine…at Bearfoot Bistro; opt for the five-course chef’s tasting menu for a full range of PNW flavors. Après...at the FireRock Lounge inside the Westin; it’s Whistler’s hidden gem for an intimate après drink. Shop...at Black Tusk Gallery for handcrafted native works and art. Nightlife…Check the theme nights at Garfinkel’s and dance late to regionally renowned DJs. Off The Slopes…Tour the Whistler Olympic Park for a peak into the 2010 Olympic venues. Whistler averages over 450 in snowfall annually; with 200+ marked runs and 16 alpine bowls, the vastness and terrain offerings are incomparable. Beginners can find a variety of slopes near the loading stations of the Peak-2-Peak gondola on both mountains, while intermediates can cruise mid-mountain areas as well as one of the longest runs in North America from Whistler’s peak. Advanced skiers, drop into the steep lines around Bagel Bowl for a good thrill. Whistler doesn’t lack in major hotels, many of which offer private residences for large groups or longer stays; luxury options are within walking distance of the main village. Get everything you’d expect from a luxury resort at the Four Seasons Whistler: elegant rooms, valet services, luxury spa, and exceptionally attentive staff. Lounge with in-room fireplaces, heated floors, and personal balconies at Sundial Boutique Hotel; the multi-bedroom suites are ideal for families. Ski-in/ski-out and ultra modern, the private home at Kadenwood 2927 boasts 6 bedrooms, media centre, and spacious living areas washed in natural light. You’ll notice a consistent farm-to-table theme in Whistler restaurants – with an elegant fine touch, of course. Step into quintessential mountain elegance at Bearfoot Bistro, which boasts over 1,100 bottles in its wine cellar and locally inspired fare; we recommend the lamb rack with pistachio olive tapenade. Dine at Rimrock Café for Pacific Northwest seafood specialities like freshly shucked oysters and pan seared venison tenderloin; the wine selection is also superb. Araxi attracts a glamorous crowd for its delectable farm-to-table dishes crafted by eco-minded head chef James Walt; they also offer an excellent oyster bar. Whistler likes to party; dance in the clubs ‘til 2 a.m., or relax at various sports bars to catch a game; hotel lounges are best for a quiet drink. Enjoy theme nights and trendy DJs spinning at Garfinkel’s; the crowd tends to be young and rowdy, and sets run late into the night. Moe Joe's is consistenlty voted a top pick by Whistler locals; DJs spin deep house, trop house, top 40, and more -- check the calendar for theme parties. Keep it casual at the Longhorn Saloon with draught beer, pool tables, and sports games on TV; it’s most crowded at après, but the after dinner crowd is also lively. You’ll recognise major brand names, as well as smaller chains from the Vancouver area; indulge cosy cashmere, native art, and handcrafted jewelry. The Aritzia chain boasts trendy women’s clothing and accessories; top picks go for elegant and mountain town functional. Hats, gloves, scarves and havy wool sweaters stock the shelves of Amos & Andes, the Whistler branch of the original Nova Scotian store. We like Black Tusk Gallery for its hat tipping to native Northwest culture; you’ll find totem poles, traditional masks, hand carved wooden goods and more. Go to Whistler Blackcomb (now). The exchange rate favours the US dollar more than it has in ten years. Whistler is super kid friendly; treat the young ones to Kids Night Out while you get dinner on the town. Best For: skiers (only); families; access to tons of terrain via neighbouring resorts. Stay…at the swanky Stein Eriksen Lodge, with ski-in/ski-out access, spacious rooms, and elegant European décor. Ski…Mayflower Bowl off Baldy Mountain for wide open powder fields. Dine…in the intimate Mariposa, which features an extensive menu of new American tapas plates. Après...with afternoon snacks, craft beer and live music at the EBS Lounge. Shop...for classic western wear (and the perfect pair of boots) at Burns Cowboy Shop in Park City. Nightlife…opt for a quiet nightcap at the fireside Troll Hallen Lounge. Off The Slopes…explore wooded trails on wheels with a guided fat bike tour through All Seasons Adventures. Deer Valley is known for its wide open cruisers; of 2,026 skiable acres, the majority are marked for beginners and intermediates. While most Wasatch resorts reserve the upper aspects of the peaks for advanced skiers, Deer Valley offers beginners top-to-bottom trails. Off-piste terrain is decent, but extreme skiing is not part of Deer Valley’s scene. For the best turns on a powder day, drop into Mayflower Bowl and the Daly Chutes. Deer Valley boasts world-class resort lodging; hotel suites offer the most comfort for families, while the mountainside homes are ideal for larger groups. You’ll find spacious rooms, full service suites, stone fireplaces and a 23,000 square foot spa at the slopeside Stein Eriksen Lodge. Drop into the cosy elegance of The Chateaux Deer Valley; located mid-mountain, it offers great access to the slopes and free shuttle into downtown Park City. Deer Valley resort rents a limited number of private residences; the 7 bedroom villa at 2960 Upper Telemark is our top pick – vaulted ceilings, private spa, and on site concierge. Fine dining restaurants are located inside the major hotels; for the main restaurant scene, head to Main Street in downtown Park City. Go for quality over quantity at Mariposa; the white linen restaurant specialises in elegant small plates like quail saltimbocca and Kumamoto oysters on the half shell; your wine glass will always get a generous pour. Indulge in scenic views and seasonal fare at Glitretind Restaurant inside the Stein Eriksen; an in house sommelier makes excellent wine pairings. Executive chef Clement Gelas continually crafts fresh, locally inspired dishes at Park City’s Talisker on Main; menu and ambiance read lively French bistro. Deer Valley quiets down after dinner, but that’s not to say you can’t cosy up in a hotel lounge with a hot whiskey and ginger; if you’re keen to party, shuttle into PC. Unwind in plush leather chairs in front of a roaring fireplace at the Troll Hallen Lounge; if you get late night munchies with your scotch, indulge in the asiago cheese fries – perfection. The bar inside Cena at The Chateuax stays lively until 11 p.m.; ambiance of the restaurant itself is casual and family-friendly. Cut some serious rug at Park City’s Downstairs; live music and classy DJ acts play into the wee hours, and a VIP room is available for larger groups. You’ll find outdoor gear and clothing in the shops dotted inside hotels and lodges, but for the real shopping, venture towards Main Street. The family-owned Burns Cowboy Shop has the best boots in town, as well as fine leather accessories. Gear up for the Colorado sun at Shades Deer Valley, which carries the newest designer eye wear. Root’d carries gorgeous, one-of-a-kind home décor pieces; this is your one stop shop for fine gifts. Deer Valley sets a limit on daily lift ticket sales; this keeps crowds down, but be sure to purchase in advance for peak periods. Park City Mountain Resort -- which now includes The Canyons at Park City -- boasts over 7,000 ac of skiable terrain; spend a few days exploring these mountains if you need variety (or if you want to try snowboarding). All for you: all the top ski vacation deals for Deer Valley. Jackson Hole’s roots lie in extreme skiing, not luxury: that’s perhaps why it’s one of the hippest spots for high-end ski getaways. There’s just something so attractive about the casual-cool, mountain town hip, nonchalance that accompanies even the ritziest hotels at the base of the resort. Since the Kemmerer family took it over in 1992, Jackson Hole has transformed from an isolated ski bum hideaway to a world class luxury resort, complete with a Four Seasons, luxury spas, and a foodie scene that rivals San Francisco. Stroll the quaint downtown draped in icicle lights and old west charm, and you’ll see first hand why luxury loves this little corner of Wyoming. Amidst the rapid growth and resort development, the Hole never lost its Soul. Best For: challenging terrain; understated luxury in North America’s soul of skiing. Stay…at the Amangani for a private resort experience with panoramic views of the Teton range. Ski…the north facing Flip Point into Laramie Bowl for the best snow on sunny days. Dine…overlooking the town square at the world-class Snake River Grill. Après...at the patio outside the Four Seasons lounge with a spiked mocha and warming fire pit. Shop...fine men’s wear while sampling a single malt at Wool & Whiskey. Nightlife…get rowdy with superb local bands and Snake River beer at the Mangy Moose. Off The Slopes…go vertical with Exum Mountain Guide’s ice climbing lessons in Grand Teton National Park. Jackson Hole’s reputation as the most challenging ski resort in North America still stands strong: over 4,000 vertical feet of alpine bowls, narrow chutes, and cliff drop-offs attract thrill seekers from across the globe. 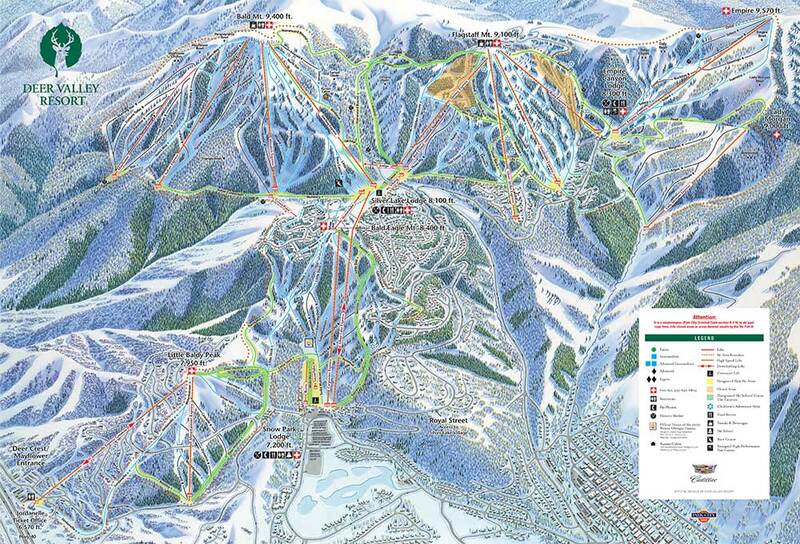 Beginner terrain is limited (only 10% of slopes are marked green). Recent resort development worked to expand intermediate offerings, which now include several blue runs off the newly installed Teton Lift between Après Vous and Casper. Regardless of where you venture, be sure to actually obey roped-off areas and “danger: cliff area” signs: ski patrol placed them there to keep you not only safe, but alive. Staying in Teton Village is best for slopeside access and the apres ski scene; downtown Jackson – 12 mi away – can be reached by shuttle or taxi. The Four Seasons Jackson Hole was the first in the world built at a major ski resort; as such, it sets the bar for slopeside luxury with private wellness spa, outdoor heated pool, and top-notch concierge. Justin Timberlake, Emmy Rosum, and Leonardo DiCaprio opt for the Amangani when visiting Jackson Hole; the private hotel boasts cosy elegance with stunning mountain views, as well as a private ski lounge at the resort’s base for gearing up in the mornings. The Clear Creek Group rents a number of private homes around the resort base; sleek and modern, we recommend the Buffalo House for ski-in/ski-out access and spacious comfort with large groups. The finest restaurants are split between Teton Village and downtown Jackson --- 20 minutes drive from the resort; chefs specialise in locally sourced, contemporary American fare. The Snake River Grill has delighted Jacksonites for over 20 years; relax in the rustic dining room with favourites like wild game sausage stuffed peppers and pan roasted Alaskan halibut with preserved lemon and Moroccan spiced tomatoes. Book a table at Rendezvous Bistro for fine steak and seafood, cosy booths, and the best raw bar in Jackson Hole; if you dine on a Friday, do not miss the nightly special of seared sea scallops in ginger-soy butter – they’re divine. The Westbank Grill at the Four Seasons is a classic white tablecloth affair; chefs serve up fine steaks and local cuisine, as well as wine pairings with a small but decent selection of wines (some of which are organic). Teton Village livens up for après ski around 4:30 and generally quiets down by 10; for most late night affairs, taxi into downtown Jackson. The late night spot in Teton Village is the Mangy Moose; go for après and stay until the wee hours, or show up around 10 p.m. for live music, local beers, and signature parmesan truffle fries. For a smaller scene, stop into the Silver Dollar Bar at the historic Wort Hotel; if you’re in Jackson on a Tuesday, don’t miss bluegrass night – local cowboys come out of the woodworks to cut some serious rug to rockin’ bands. Antique stores, fine art galleries, and boutiques outfitted in locally crafted gifts and clothing line the streets of downtown Jackson; you’ll also find a few options in Teton Village. Men can find rugged, modern and sophisticated clothing at Wool & Whiskey while indulging in a fully stocked whiskey bar at this spot in Teton Village. Down a staircase from the sidewalk on the town square, you’ll find The Bootlegger, which stocks high-end, popular brands like Frye and Dansko. For hip, locally made gifts (without the chintz), check out Made, which boasts two locations – inside Hotel Terra at Teton Village and tucked in Gaslight Alley in downtown Jackson. When booking a private instructor, you can specify who you’d like to ski with or what personality you’re looking for – the Mountain Sports School will do their best to match you. If renting a car, take it easy on the roads; ice, snow, and (huge) wildlife are common on roads in winter – especially over the bridge crossing the Snake River on WY-22. Go for it: browse the best ski vacation deals for Jackson Hole. Best For: flying under the radar; luxury skiing in a classic Colorado mining town. Stay…at Hotel Madeline in Mountain Village for ski-in/ski out luxury and a full service spa. Ski…the intermediate runs in Prospect Bowl for an early morning warm up. Dine…with panoramic mountain views and a 90-day dry aged ribeye at Allred’s. Après...at the Oak Bar; the scene is casual and family friendly, with a strong local following. Shop...for handcrafted European goods at Alpen Schatz Boutique. Nightlife…Check out the shows at Fly Me to the Moon Saloon, Telluride’s premeire live music venue. Off The Slopes…Fly high with a tandem paragliding flight; you’ll be partnered with a pro, and no previous experience is required. Telluride’s 147 trails offer a decent spread of mixed level terrain: 23% beginner, 36% intermediate, and 41% advanced/expert. The resort ranked #1 in scenery for 2016 in SKI Magazine, and several lookouts from to top half of the mountain offer stunning views of the mountainscape. There are two base areas: Telluride and Mountain Village. Beginner terrain access is primarily from Mountain Village. Telluride is also famous for its extensive hike-to terrain, accessed along the resort boundary from Revelation Lift and Prospect Express. For modern resort luxury, stay in Mountain Village; if you’re seeking Colorado quaint or late night outings, opt for historic downtown. Hotel Madeline offers the best of the five-star Mountain Village experience: lavish rooms, stone fireplaces, on-site spa and multi-bedroom residences. The Inn at Lost Creek – also in Mountain Village – is known for impeccable service and homey rooms with private balconies and mountain views; the bar and restaurant quiet down around 9 p.m. Complete with home theatre, private hot tub, and stunning living space, the 7 bedroom Knightsbridge estate is our top pick for group getaways. Telluride chefs pride themselves on preparing dishes using the finest local meats and veggies; most fine dining features contemporary American bistro with some European influence. Set in a 19th century cabin downtown, La Marmotte features classic French fare; menu changes nightly based on the freshest available ingredients, but expect delectable and creative eats – like their roasted mahi mahi dusted with bee pollen and sage black garlic sauce. Ask for a window seat at Allred’s, Telluride’s premeire mountain top restaurant; chefs specialise in steaks and seafood, incorporating organic fare when available. Settle in at 221 South Oak, where Telluride locals always go for consistently fine meals; well crafted comfort foods are the theme, and we’re told not to miss a piece of the legendary pecan pie. Telluride is small, at just under 4,000 full time residents – but they certainly like to have a good time; expect craft beers, rustic bars, and the occasional late night live music gig. The Last Dollar Saloon (aka “The Buck”) is the local hot spot for a good strong IPA and lively conversation; located in historic downtown. Serving libations to thirsty cowboys since 1895, the bar inside the New Sheridan Hotel offers the best drink specials in town; it’s also open ‘til 2 a.m. – rowdy for tame Telluride! For live music, check the schedule at Fly Me to the Moon Saloon; this funky underground bar gets surprisingly noteworthy national acts. A surprising amount of gift shops line the streets featuring all the classic Colorado t-shirts and swag; we recommend dipping into one of the stores below for something more unique. Alpen Schatz Boutique imports handcrafted goods from the Alps; the selection is eclectic – think German Steins to classic Swiss dog collars to everything in between. Check out Picaya for sustainably sourced goods from across the world; they specialise in home furnishings, textiles, and gorgeous jewelry. Any local, concierge, or visitor will tell you not to miss Telluride Truffle – these sumptuous handmade chocolates make excellent holiday gifts (or afternoon pick-me-ups). The free gondola between Telluride and Mountain Village runs from 7 a.m. to midnight; plan to stay downtown if you’ll be out past then. Fly directly into the Telluride Regional Airport to save time and hassle; it’s located just 6 mi west of town. Ready to book? Here's your ticket to Telluride. Oh, Canada: Find Whistler Blackcomb deals here.